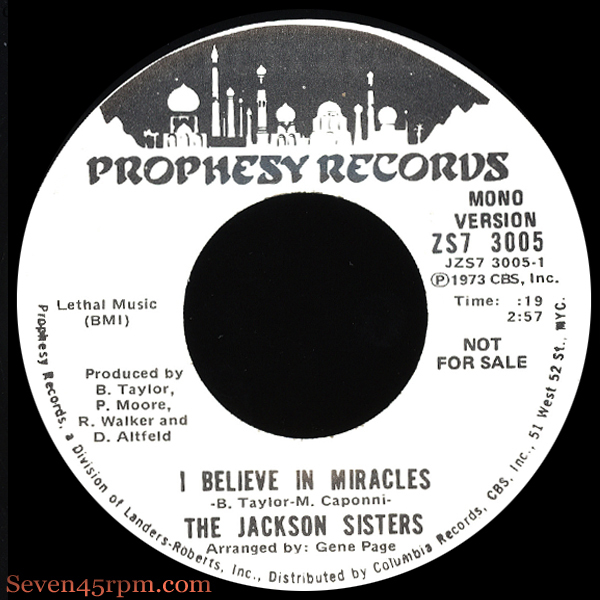 Detroit based sibling funksters, The Jackson Sisters, bring you this absolute killer version of Mark Capanni’s I Believe In Miracles, circa 1973. The Jackson Sisters were a soul family group from Compton, California, comprising of Jacqueline Jackson-Rencher (the eldest), Lyn Jackson, Pat Jackson, Rae Jackson and Gennie Jackson (the youngest). The girls would practice on an old beaten up piano in their dad’s garage, composing songs after school, and would draw all the neighboring kids to watch. After a handful of talent show wins, the young siblings soon found themselves opening for Smokey Robinson and the Miracles, then known as The Mark Taper Form. It was Smokey’s farewell concert (entitled The Last Miracle) and include other feature acts including Al Green, Edwin Starr, Eddie Kendricks, The Whispers and The Three Degrees. It was 1973, and within that same year, they signed a contract with a small recording company, Prophesy Records in Beverly Hills, California. That is when they recorded I Believe in Miracles, co-written by Mark Capanni & produced by Bobby Taylor. This track is truly a rich and rare funk, soul classic, with amazing harmony vocals, and a tempo that really would light any dance floor on fire! I believe it is the youngest of the sisters, Gennie, that takes most of the lead vocals on the song (I’m guessing she’s running that bridge that leads to the monster chorus), and her vocal power is pure brilliance. And no surprise that they were nominated for best new vocal group for the Black Image Awards and best new female artist by Record World Magazine in 1974-1975 which was announced on Soul Train an aired Feb. 22, 1975. Sadly the parent album, scheduled to be released on Tiger Lily Records in 1976, was withdrawn, although a few promo copies went into circulation and they now retail for big bucks as one would expect. The musical tracks were the works of the late great Gene Page. The vocals were produced by Pete Moore of the famous Smokey Robinson & The Miracles along with Bobby Taylor. While they did get to release a few 45’s, Miracles is the most sought after and not too easy to find. Originally on a red Prophesy label with the flip (Why Can’t We Be) More Than Just Friends, and also as a white label promo with 2 heavy cuts of track A, one in big fat mono! There was also a release on UK label Mums Records, and a re-release on Polydor in 1976. 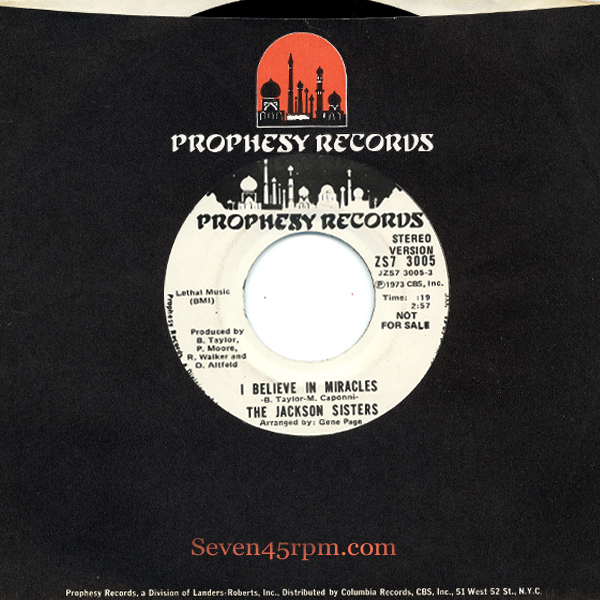 The original version of I Believe In Miracles, which was first recorded in 1973 and performed by Mark Capanni, is an absolute beautiful soul masterpiece, well deserved of the highest praise and well worth tracking down. Despite the Capanni version having been pressed, it failed to make an impact and the record was pulled, making it very sought after. But it was the Jackson Sisters that did the dance floor business, with their feverish thumpin’ funk monster, which was unleashed in 1974.